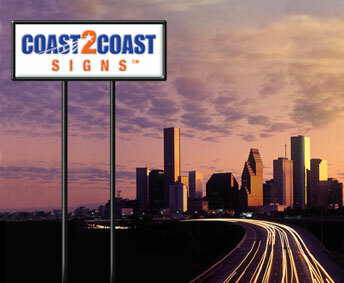 In December of 2012 our President, Dave Theobald, learned about a Texas company called Coast2Coast Signs (C2C). Since 1992, C2C has provided professional sign installation and maintenance services to the greater Houston area based on a commitment to quality, honesty and reliability. C2C's commitment to excellence matched that of Turman. The two owners met and the blending of the companies was the natural result. Health issues of C2C's previous owner necessitated a swift transition of the business effective January 2nd of this year. Like Turman, C2C is grounded in the merit shop philosophy - that work should be awarded on the basis of qualifications, performance and price - in an open marketplace. Providing quality workmanship in a safe environment for fair prices is the way we choose to do business. Our expert installers will ensure that graphics are safely and properly installed. Our extensive sign installation services include awnings, banners, cabinet signs, channel letters, directionals, handicap signs, high rise signs, illuminated signs, LED, menu boards, monument, neon, post mounted, pin mounted, storefront and vinyl. And C2C is committed to our clients brand image long after installation. We provide full service maintenance for all of the signs we install including maintenance contracts, scheduled services night or day and parking lot lighting maintenance. Additionally, our restoration experience gives us the know-how to clean, repair, paint and seal any surface. We can also meet our client's signage construction needs. Our skilled professionals can weld, lay foundations, work cranes and perform electrical work. In addition, C2C signs will take care of permit procurement, design needs and survey requirements. C2C's expertise in all of these areas means quality craftsmanship on all of our jobs. In addition, each employee is dedicated to our core values - relationship driven, integrity, and excellence in all that we do. Utilizing the latest technology and highly skilled professionals, we provide services that exceed our clients' expectations. While the corporate structure of Coast2Coast Signs has changed, the personnel and the quality sign installation services that C2C's customers have come to expect have not. C2C will continue to deliver superior service backed up by its twenty years expertise in the sign installation industry, as well as the backing of a forty-year-old national painting company. For more information about C2C, check out our website at www.coast2coastsigns.com. Washington Commercial Painters Wins ABC Excellence Award For U.S. Coast Guard Project. On May first of this year, Washington Commercial Painters (WCP) was awarded the ABC Excellence in Construction Award for their work at the United States Coast Guard Station in Seattle Washington. The scope of the project was off the charts. 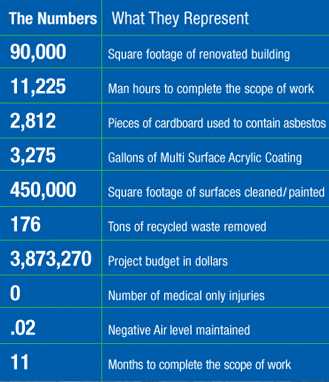 In the span of eleven months WCP cleaned and painted over 45,000 square feet of surface area while recycling 176 tons of waste. See the chart below for all of the numbers on this impressive project. The project began back in September of 2011, when North Wind Services of Idaho Falls Idaho called WCP for assistance with a 90 thousand square foot building that was built in 1943 and is home to the Coast Guard's administrative offices, armory and gym. The condition of the building was poor and health risks were a main concern. Mechanical units were covered in inches of dirt and dust, pigeon guano covered the tresses and lead paint was blistering off the steel structure and wood catwalk. Due to budget constraints, a full lead abatement was not an option. North Wind came to WCP seeking a creative solution for its clients: one that would create a livable environment for the Coast Guard and would not disturb their work below. Excited by the opportunity and the challenge, WCP immediately assembled a team which consisted of Berg Scaffolding, Mega Wrap (specializing in containment) and Aqua Brite (specializing in shot blasting). Together we came up with a plan to provide a gross cleaning of the building at lower levels and the removal of flaking lead-based paint such that the surfaces were prepared to accept encapsulating coatings. A full repaint was to be done on the ceiling, steel structure and wood catwalk, without disturbing the asbestos ceiling panels. The building was sectioned off into seven phases. In each phase a safe work platform was constructed above the ceiling of the existing offices to within two feet of any horizontal surface and within ten feet of any overhead surface. Once the platform was in place, scaffolding was erected in the upper area for access to the entire ceiling by an arm's length. Each phase was completely enclosed with shrink wrap and treated as Class 1 and Class 2 asbestos-related work area. Negative air pressure was created to ensure that contaminated air would not escape containment to other parts of the facility. Once containment was assured, cleaning of the asbestos ceiling panels was performed by light brooming to remove layers of dirt and dust. A single coat of Sherwin Williams Pro Industrial Multi Surface Acrylic was applied to seal and encapsulate the cement asbestos ceiling panels. The panels were then protected with rigid construction cardboard and the inside edge was sealed with duct tape to prevent media blast from penetrating through. Sandblasting hoses were run from the equipment outside into the containment area along with ducting from the 24,000 CFM dust collector equipped with HEPA filters. Using the dust collector WCP was able to establish negative air to keep any air born dust from escaping the contained area. Sand blasting was done on all steel support structures, fire walls, and wood catwalk to a combination of bare surfaces and tight coatings. A product called Blastox was used to stabilize the lead-based paint to ensure classification as a non-hazardous waste. Once sandblasting was completed, the waste was collected and bagged using the dust collector and vacuums using diesel trailer-mounted machines that remove and bag the used sand blasting material. The bags were analyzed by employing toxicity characteristic leaching procedure, sterilized and 176 tons were taken to Evergreen recycling facility. After sandblasting was complete, 2,812 8' x 4' pieces of cardboard was removed and taken to recycling. The area was then prepped for painting. Two coats of Sherwin Williams Pro Industrial Multi Surface Acrylic Coating were applied to all substrates for a total of 3,275 gallons. Gross cleaning was then performed on all surfaces and a final wipe down of metal railings and concrete floors was done using a mild detergent. The end result of the extensive year-long effort of the WCP team is a high quality environment that the Coast Guard and its men and women will enjoy for years to come. Our work brightened the warehouse and provided a healthy environment for the people that work within the building, consistent with our company mission of "creating environments where people want to be." WCP faced many challenges, including health hazards, and working within tight areas, all while working over occupied spaces. WCP met all schedule requirements, coming in on time and on budget with a perfect safety record and provided an excellent environment to the United States Coast Guard. The United States Coast Guard lead paint remediation project exemplifies excellence in construction. We at Turman are committed to safety. "Safety Above All" is not just a logo we use but a motto we live by. A number of years ago our Experience Modification Rate (a 3 year measure of workers compensation incidences) became a concern. With a commitment to have all employees go home safely to their families at the end of the day, we turned a critical eye to our safety program. We implemented a new safety campaign including a monthly safety theme of the month, an overhaul of our Safety Manual, a fresh Fleet Safety Management Program, safety surges where job sites were visited by supervisors without notice and recently an effort to use technology such as iPads and iPhones to make daile cut y forms easier to complete and track. Since 2006 we havour EMR by more than half. Our EMR has been below 1 since 2010. 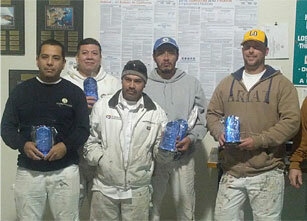 In December 2012, Turman gave out its first Above & Beyond Awards to Jorge Ortega, Juan Lainez, Gabriel Ortega, Juan Ramirez and Ron Lowery (see picture below) for project excellence and safety at Intel Santa Clara for Turner Construction and Larry Barnhart for his work at Intel Folsom, 2 years incident free, also for Turner Construction. Our employees and our clients know we are committed to the safety of all of our personnel. Welcome to Painter's Corner. A place where you can learn about painting and restoration techniques from the pros. We hope you find these tips helpful. Painting and restoration can be hard work. 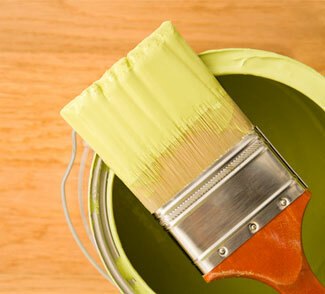 Here are some tips from our pros that will make your painting and restoration projects easier. 1. When you have no access to water wrap you paint tools in plastic until you can clean with soap and water so they don't dry out. 2. When rolling ceilings make sure to roll with your mouth closed. This is funny but factual. Turman opens new office in Houston. See a list of Turman's national offices and affiliates here.